Frederik 7th had not worked much with government matters and had not become any special education. He could to some degree be unreliable, and often had he lived in taut relationship to the court. When Frederik was one year old his father was banished to Horsens, and various family members undertook his upbringing. The upbringing was bad, and the education was insufficient, so he was not equipped for the coming work as a king. But at the same time he had a good mood, an even popular way of thinking and an ability to act at the same time royal and kind, which made him loved by the common man. The council of the state had in Christian 8th’s last year of living been occupied by preparing a free constitution for the whole monarchy. Therefore Frederik 7th could as early as the 28th January 1848 issue a constitution, which was as follows: The kingdom and other possessions are regarded equal. In a joint assembly, which had decisive power, should preside equal number of members from each of these two parts of the monarchy. Hereby the king had rejected absolute monarchy. Frederik 7th did not seem to regret the loss of power of absolute monarchy. Now he could spent more time on archaeology, which was one of his hobbies. The events in 1848 led to the so-called three-year war 1848 - 1850. This action was won by the Danes, because the German minded Slesvig-Holsteners did not get the necessary support from Germany. In Denmark the victory in some circles was regarded as a victory over Slesvig as well as Holsten and Germany, and this mistake in analysis should have fatal consequences 14 years later. Frederik 7th was born at Amalienborg on the 6th October 1808 as the only child of Christian 8th and Charlotte Frederikke. He was in 1828 first married to Vilhelmine Maria (Frederik 6th’s youngest daughter). In 1837 they divorced because of personal disagreements. The 10th June 1841 he was married the 20 year old Caroline Charlotte Mariane of Mecklenburg-Strelitz, but it did not turn out better, and in 1846 the marriage was broken up. The third marriage in 1850 was to Louise Danner, former ballerina, daughter of an unmarried maid. All three marriages were childless. 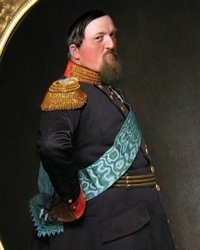 King Frederik 7th died 15th November 1863 and was the last male descendant of Det Oldenborgske Hus.